Simply make a long cast over structure or weeds and give it an initial “twitch”. Then…let the bait sit until the rings disappear…then repeat this process back to the boat. Tips Patience, Patience, Patience is the key with this technique! Start by letting the bait sit for about 30 seconds between twitches and then gradually lengthen the intervals until you produce a strike. 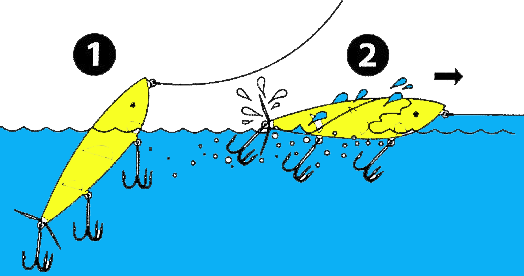 When fish are sluggish allow the bait to sit several minutes between “Pops”. A slow but effective way to get BIG FISH to strike! When fish hit the bait while using the technique they tend to hit like a freight train, so try not to jerk the rod to quickly. Give the fish a chance to get it firmly in it’s mouth. Usually, its….Strike count one…then set the hook! Its not easy… but it will help increase your hooked fish. The windier the conditions the harder you can work the bait! This method drives big fish crazy and will produce incredible strikes!! !